When it comes to gift wrapping I like to keep it rather simply therefore you won't be surprised that the basis for my packaging is (once again) simple brown paper. 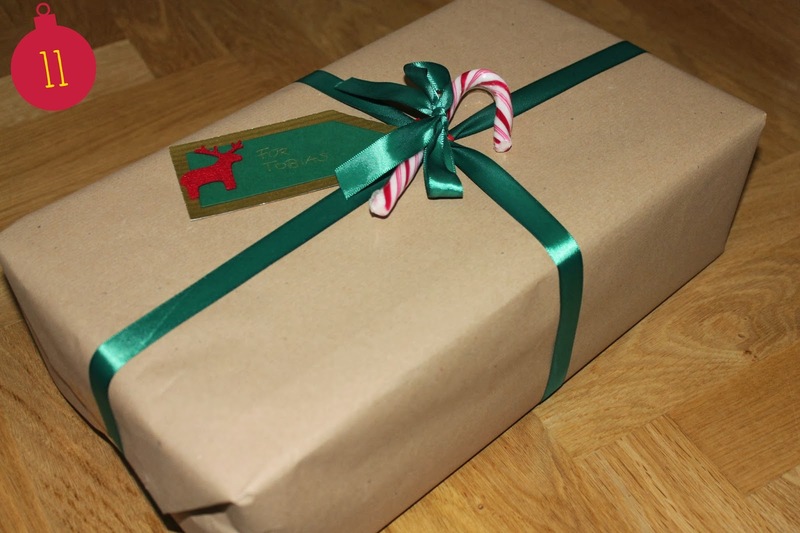 Start by wrapping your gift into simple brown paper. Put the gift ribbon around the package and tie the candy cane to the gift ribbon. For the gift tags I cut out a bigger tag of gold cardboard (about 8,5 x 5,5 cm plus the rectangle with ca. 4,5 cm side length) and a smaller tag of green paper (about 4 x 8 cm plus the rectangle with ca. 3,5 cm side length). Then I glued the green tag onto the gold tag and embellished it with the Christmas sticker. Use a puncher to make a small hole into your tag and fix it with a short piece of ribbon at your gift package.